Gift-giving is one of my favorite things about the holiday season. When you do it right, it just feels good. I usually try to pick things up when I see them for the people on my list throughout the year. More often than not, though, I usually have quite a lot of last-minute shopping to do. Not to mention the Secret Santa gifts, the White Elephant Parties, and the hostess gifts. 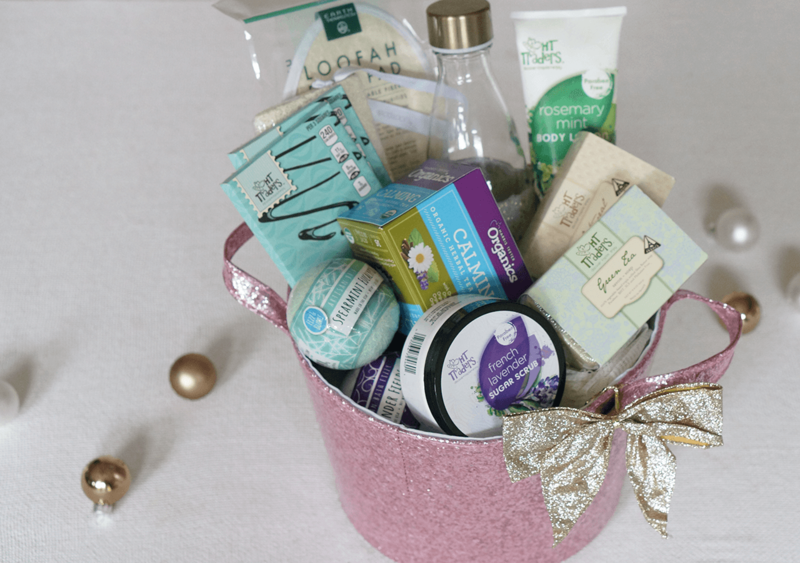 Making DIY Gift Baskets is one of my favorite holiday season hacks. Pick a theme, get a basket and filler, then load it up with treats sure to delight. I’ve created six themed holiday basket gift ideas that I’ve found are great go-tos for practically everyone on your list. Even better? You can get most of the supplies at your local Harris Teeter! Pasta, sauce, a perfect bottle of Chianti. 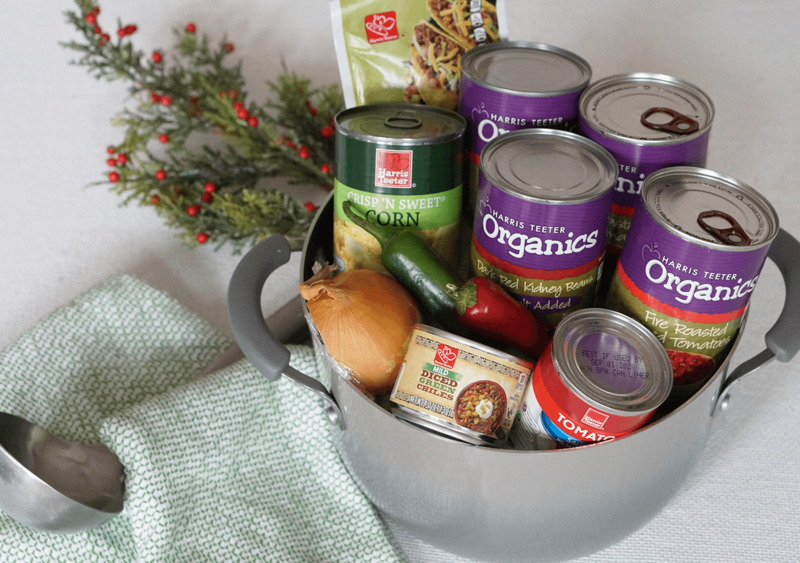 This gift basket has everything for a delicious dinner in… even the colander! The holidays can stress a gal out, so treat her to some me-time. Favorite body products, chocolates, tea and a water bottle make this a gift she’s sure to love. 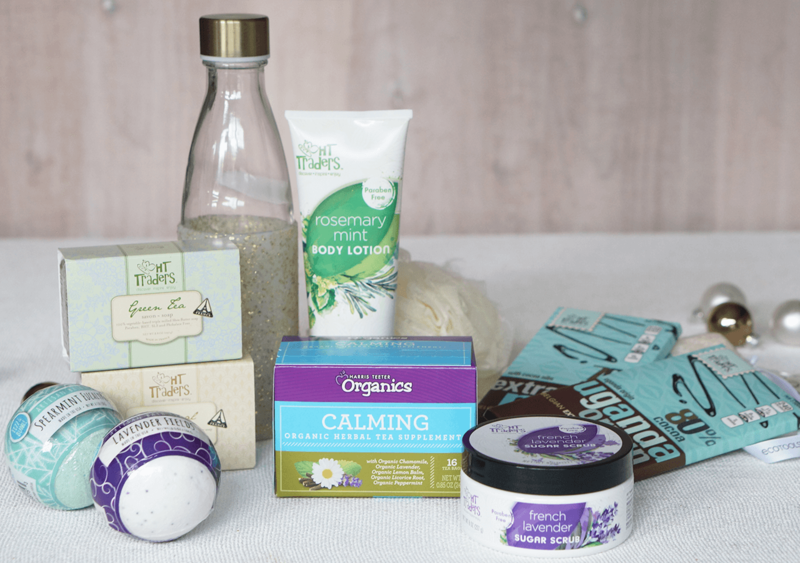 Featured items include: HT Traders Green Tea and Oatmeal Soaps, HT Traders Rosemary Mint Lotion, HT Traders French Lavender Sugar Scrub, loofah and exfoliating cloth, a reusable glass water bottle, and bath bombs. Know how to guarantee an invite to next year’s holiday party? Show up with this Bloody Mary Kit presented in a beverage bucket for the host! Featured Items include: Bloody Mary Mix, vodka, Harris Teeter Spanish Stuffed Queen Olives, Harris Teeter Hot Sauce, HT Traders Marinated Pepperoncini, HT Traders Green Garden Style Spice Grinder, and cocktail picks. Dinner time can be especially frantic during the holiday season. 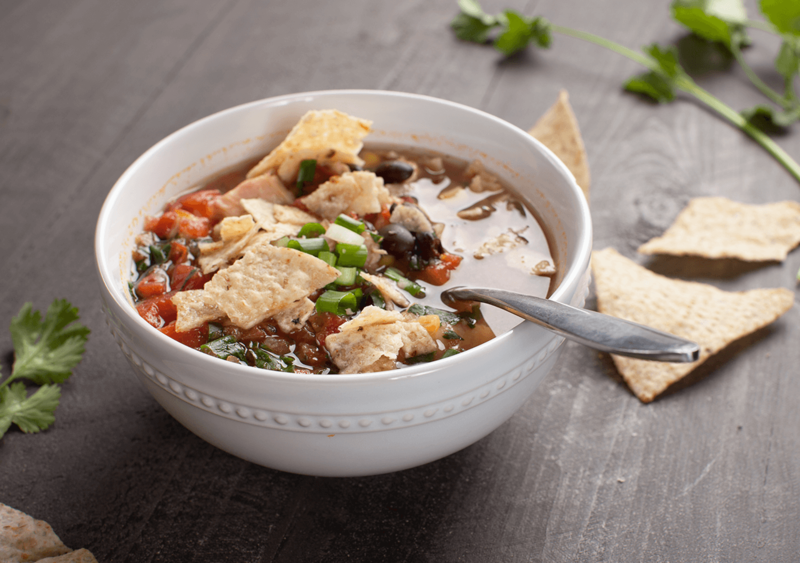 Gift this Taco Soup Kit served up in a soup pot to a busy mom in your life! Find the recipe here! Harris Teeter Organics Dark Red Kidney Beans, Harris Teeter Organics Chili Beans, (2) Harris Teeter Organics Fire Roasted Diced Tomatoes, Harris Teeter Crisp ‘n Sweet Corn, Harris Teeter Diced Green Chiles, Harris Teeter Taco Seasoning, onion, and jalapenos. Traveling for the holidays? Gift your hosts this Breakfast in Bed basket for a much-deserved morning treat! Featured items include: Harris Teeter Breakfast Blend K-Cups, HT Traders Premium Coffee, Thick Cut Fully Cooked Bacon, HT Traders Maple Syrup, pancake mix, and assorted fruits. Don’t overlook man’s best friend this holiday season. Be sure to pick up everything you need for this Pampered Pooch Gift Basket at your local Harris Teeter! Featured items include: Blue Buffalo Dog treats, assorted chew toys and balls, training treats, and a no-slip water bowl. Katie Harding is the publisher of Forks and Folly . A self-taught cook and die-hard foodie, Katie lives in Charlotte with her husband and three boys. Besides cooking and eating, she loves craft beers, running, and napping.